Experience Years of translation experience: 7. Registered at ProZ.com: May 2007. Became a member: Apr 2013. 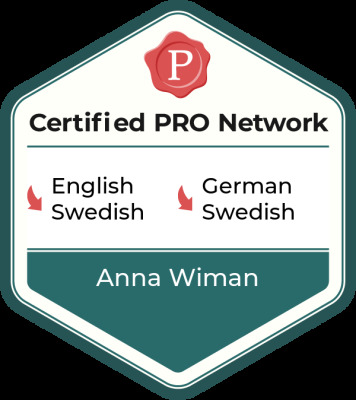 Professional practices Anna Wiman endorses ProZ.com's Professional Guidelines. I am a native Swede but was born in Geldern, Germany and attended German school before returning to Sweden in 1995. I was raised in a language-loving, freelance translator home, constantly surrounded by both English and German. My parents have been in the business over 20 years, translating from English and German into Swedish hence growing up, translation and terminology was always a topic at the breakfast table. My main interests since childhood have been travel and languages. By the age of 23, I had visited 30 countries in Europe and overseas. 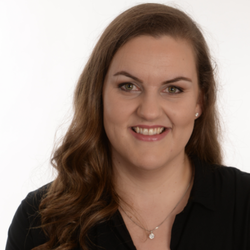 I am a graduate (BA Media, Communication and Public Relations) of the Linneus University in Växjö, Sweden. - During 2007-2008, I took advanced level German at three different universities in Germany; the Humboldt University in Berlin, the University of Lüneburg and the University of Passau. - During 2009-2010, I was enrolled as a student at the University of Lüneburg and I took classes in advanced German, media globalization, war journalism and political science among others, all in German. - In 2010, I obtained the DSH2 (German language proficiency test on an advanced level) at the University of Lüneburg. The diploma is a proof of advanced proficiency. - as a public relations assistant with NATO in Prishtina, Kosovo. - as a freelance journalist based in Prishtina, Kosovo. - with tourism and as a substitute teacher at a local school (pre-school to 6th grade) in Sweden. 2nd Moderator Meeting: Sitges, Spain 2004. 3rd ProZ.com International Conference: Krakow, Poland, 2005. 5th ProZ.com International Conference: Budapest, Hungary, 2007. ProZ.com Regional Conference: Kharkov, Ukraine, 2008. 6th ProZ.com International Conference: Ohrid, Macedonia, 2009.